This interesting surname is of early medieval English origin, and is a patronymic from the Middle English given name Rand(e), a short form of any of the various Germanic compound personal names with the first element "rand" meaning "shield, rim", for example Randolph. The surname dates back to the mid 14th Century (see below). Further recordings include one John Randson (1395) "Cartularium Abbathiae de Whiteby", and Elizabeth Ranson (1518), Suffolk, "Index to Wills proved in the Consistory Court of Norwich". London Church Recordings include one Thomas Ransome who married Amy Davys on October 5th 1614 at St. Giles, Cripplegate, Samuell, son of Thomas Ransom, who was christened on November 12th 1634 at All Hallows the Less, and Elizabeth Ransom, who married William Harrison on November 3rd 1639, at St. Giles, Cripplegate. One Robert Ransome (1753 - 1830), an agricultural implement maker; he took out several patents, including a most important one in 1803 for an improved ploughshare. 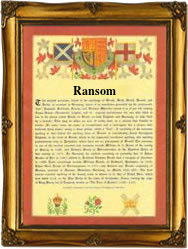 The surname can also be found as Ranson, Ransome, Rands and Rance. The Coat of Arms most associated with the family is a blue shield, on a gold chevron three red roses, an ermine canton, the Crest being a blue hawk's head erased, in the beak a gold annulet. The first recorded spelling of the family name is shown to be that of William Randesson, which was dated 1347, in the "Subsidy Rolls of Cambridgeshire", during the reign of King Edward 1, known as "The Hammer of the Scots", 1272 - 1307. Surnames became necessary when governments introduced personal taxation. In England this was known as Poll Tax. Throughout the centuries, surnames in every country have continued to "develop" often leading to astonishing variants of the original spelling.